Railpictures.ca - A.W.Mooney Photo: When GEXR had this locomotive on loan, it took the nickname “Barney” from the railfans. Most of you will know that Barney was the name of that silly dinosaur featured on some kiddie show I have forgotten the name of. As much as I detested that big purple fleabag, I really liked this purple locomotive. A paint scheme like no other we have seen around here. And so this image deserves a spot on Railpictures. The North Carolins/Virginia Rwy is but a 49 mile line, mostly in North Carolina. It started up in 1987. Barney is no longer with the GEXR, but went to New England Central in 2006. I hope it has not been painted to the sickly orange, as all three roads mentioned here are now part of the Genesee & Wyoming family. Most of you will recognize this image was taken opposite the VIA station in Kitchener. | Railpictures.ca – Canadian Railway Photography – photographie ferroviaire Canadienne. Caption: When GEXR had this locomotive on loan, it took the nickname "Barney" from the railfans. Most of you will know that Barney was the name of that silly dinosaur featured on some kiddie show I have forgotten the name of. As much as I detested that big purple fleabag, I really liked this purple locomotive. A paint scheme like no other we have seen around here. And so this image deserves a spot on Railpictures. The North Carolins/Virginia Rwy is but a 49 mile line, mostly in North Carolina. It started up in 1987. Barney is no longer with the GEXR, but went to New England Central in 2006. I hope it has not been painted to the sickly orange, as all three roads mentioned here are now part of the Genesee & Wyoming family. Most of you will recognize this image was taken opposite the VIA station in Kitchener. Interesting capture in the landmark Kitchener location. This unit was around during my early days of rail photography, and in my earliest memories of GEXR. GEXR had a whole hodge-podge of random “rent-a-wreck” type locomotives….CEFX 6537, GEXR 4046, to name a few. Jason, interesting you mention 433. Does anyone know when that train was cut? Thanks, Mr. Noe ) Always good information available from you guys on RP. I do recall that frame train, and somewhere here I think I have a pic of it with Barney doing the honours. NCVA 3843 didn’t last long before GEXR removed the NCVA lettering sometime during 1999, so photos with it still on while operating on GEXR are somewhat scarce, which is also why this shot is neat. The crews really liked this unit, which might have been why it was never returned to NCVA. It was often assigned to train 433, which was the dedicated frame train from Kitchener to London at the time. 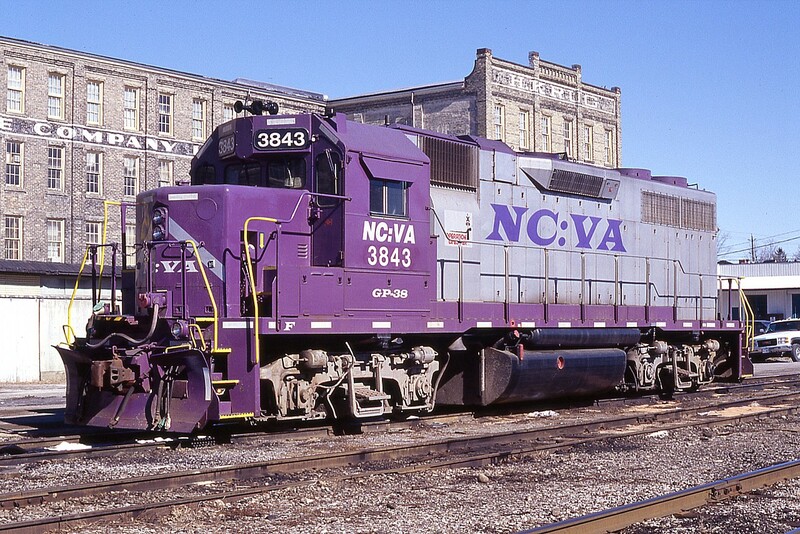 As a side note: NCVA also had GP9 6244 painted in this unique scheme… Barney Junior maybe? Last photos of it are in 2013, still operating in the colors, however minus the NCVA lettering. The description made me laugh. Thanks, Mr. Smith. I don’t think I have a shot of it lettered GEXR. It originally came here to help with expansion/loco problem pains. Correction, I rode the International to Sarnia. South Bend was the following year. Not that anyone cares. It did indeed become GEXR 3843. I took a photo of it lettered as such Aug. 19, 2001 before getting on the International to visit bro in South Bend, IN. I can honestly say that I never watched one of the shots that you just listed Host! Including BARNEY. Now Thomas The Tank Engine…that show was legit. I understood it was on loan……..thats why it did not, to my knowledge, sport the ‘GEXR’ under the cab. However, as you know, shortline power under the same banner could end up anywhere. And NCVA was Railtex back then, as was GEXR. Oh that Barney was about as low as things could go for a time there. Just the sight of it UGH! It is a shame so many parents had to compete with trash like this while trying to induce common sense and intelligence into their little one’s noggins. This unit was on loan? The thing is I have shots of it, but not too many, I didn’t follow GEXR that closely and not sure how long it lasted.. but at least 5 years.. I shot it approx 2004 at least, maybe into 2005..
Barney the show was horrible – my brothers watched it. Just about all Millenials around age 24-20 watched it as young kids. And it got worse : Teletubbies, Power Rangers, Pokemon! Riveting shows and dialog. That’s why I call them the “mush for brains” generation. What an interesting and unique colour scheme Mr. Mooney! A great capture! The show was called “Barney” Arnold. I didn’t realise it came here in full NC:VA paint. Pretty nifty!